VITANOVA Signature™ line of products offers a full range of premier vitamin and dietary supplement products for sales and distribution in several regions around the world. Our products are premium supplements manufactured based on most up-to-date quality assurance and quality control techniques in the U.S. These products are built around quality with 12% of the manufacturing workforce are directly involved in quality control and quality assurance procedures. For VITANOVA Signature, uncompromising quality is not an option - it is an obligation. It is not a vague goal – it is standard operating procedure. For complete list of Vitanova products, please visit VITANOVA Signature™ Products page. All incoming raw materials are thoroughly tested before they are released for use in VITANOVA Signature products. Ongoing quality assurances set forth by our elite standard operating procedures meet and exceed current GMP standards and ensure that VITANOVA Signature products are of the highest caliber meeting label claims for purity, potency, and efficacy. Under such quality assurances, specialized quality control technicians repeatedly inspect production and packaging areas, and a dedicated cleaning staff maintains the entire facility during all working hours. In addition, all employees receive ongoing training in cGMP standards so that both our products and facility exceed our clients' expectations. VITANOVA Signature Products are tested at regular intervals during critical points in the manufacturing process to ensure that quality specifications are maintained. When the products come off the line, quality measures do not stop there. They are also tested for a full spectrum of microbiological contamination to ensure the products are safe for release. * Our products may be marketed in various countries/regions under different brand names. For more information, please contact our Marketing Department. 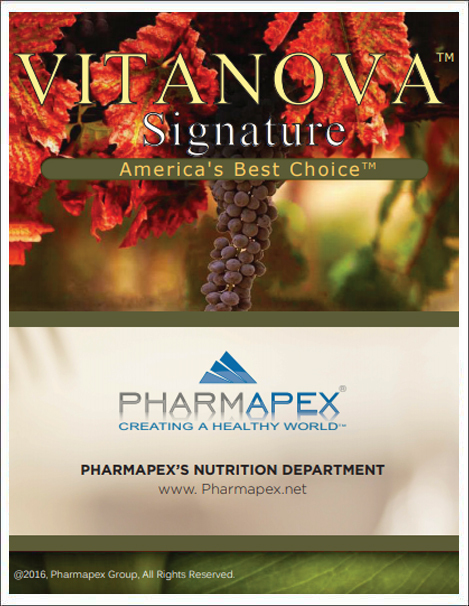 To download the catalog of our Vitanova Signature supplements, click here.